No, I haven’t been swimming in the deluge of water that’s come to Texas. It finally stopped raining for a couple of days, and I’ve gotten back on the bike. I missed it. We’ve had some off-on showers, like the one that passed over us yesterday afternoon. It was the length of an average song by The Monkees. Haven’t drowned in a vat of melted chocolate, either–I wish. In fact, I haven’t had chocolate in a while–but that’s a good thing. The most dangerous thing I’ve done recently is go visit Neighbor E and mess with his newly adopted cat. Big, fluffy and sweet, even to the dog, but she does like to bare her claws, too. I found this funny online somewhere a while back and have forgotten to include it. I’ve made some kitchen mistakes, as everyone has, but despite what might the GER might tell you, I’ve never been this bad. Thought you might enjoy that one. There is a sudden bunch of little flowers at the top of the tree that should yield a few more of them. Whenever it ripens, it will be red. And these are little yellow SunGolds. See the previous rootlings that are growing? Although it’s officially summer, we’ve been warmed up for a while. Now that it’s June, well, you won’t be wanting to turn on that stove anymore, will you? Have you dusted off your Crock Pot and started cooking in it yet? Why not? Check some of my older posts for some recipes, or hit Pinterest and search there. You’ll never run out of recipes for your Crock Pot or waffle maker there–trust me on that. (No grapes into the Crock Pot=wine yet.) Seriously, though, there’s no reason to heat up the kitchen if you don’t want to. And I found another “forget it” thing to tell you about that can keep you cool this summer, and make mornings a little easier, whether you’re single or married with children. But first. . . .
Sue Moran of The View From Great Island just posted something she calls “Vegan Breakfast Bowls.” Now, they do look tasty, but they’re not the tofu-and-bean combination that might spring to mind. Sue’s breakfast bowls are more like granola types of mixtures with fruit, nuts almond milk, chia seeds and the like. (The post is sponsored by the producer of the non-dairy milk she uses. I’ve never seen 1915 BoltHouse Farms products, and they are available here–but I’m not touching soy milk.) I’m a bit skittish about using chia seeds after my experience a couple of years ago, but occasional chia dishes might be OK. I haven’t tried them since, but I would always urge caution and suggest backing off if you find yourself with gut pains. So, another item I’ve seen on Pinterest and places like Facebook is something called “Overnight Oats.” Bloggers have been doing them for some time, I just never paid attention because. . .I generally don’t eat oatmeal. I got some coupons on Friday, and in the flier, I see that Quaker Oats is getting in on the act. It’s really simple, you just soak them overnight in milk with some other ingredients to make a full meal. Quaker’s page has a primer on how to put them together, including a YouTube video. Got any Mason jars around? There you go–toss it together the night before and stash in the fridge. (But it’s not mandatory–any big enough bowl or container will do.) Your breakfast is waiting for you in the fridge. How easy is that? But it can get boring. . .so I head over to Pinterest and find some new stuff. Oh, boy, did I find some, too–not all of them Paleo/Sugar-Free versions, but who cares? I’d forgotten until just now that Ree Drummond, The Pioneer Woman, has made two recipes on her Food Network show for Overnight Oatmeal–one for her daughter’s Dorm Room Dining episode, and another when she found herself alone on the ranch. Two of the more photogenic and interesting recipes I found on Pinterest are the Lemon Cream Pie Overnight Oats from Destination Delish, and the very decadent Hazelnut Brownie Batter Overnight Oats from Life A Little Brighter. 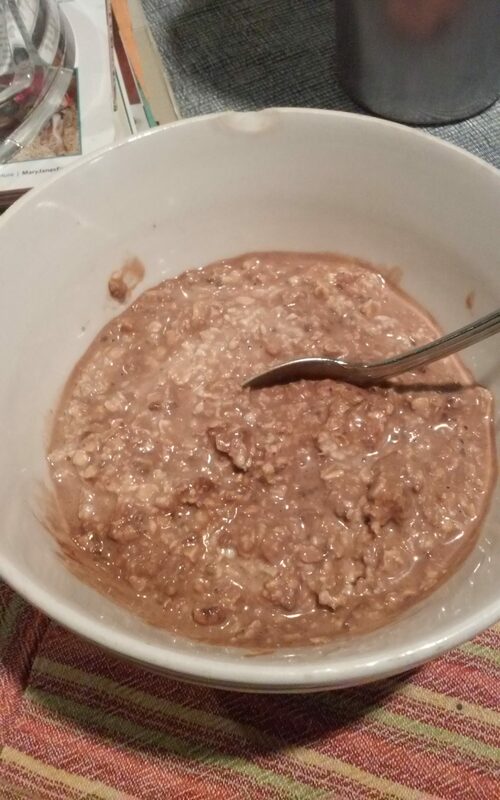 Granted, using coffee creamer in your breakfast oatmeal might be a bit unusual, but. . .if it’s what floats your boat, so what? I think that would be a “special occasion” kind of recipe for me. I don’t buy that kind of thing, never did. Just give me milk or half-and-half for my coffee, please. The suggested container is a Mason/Ball jar, and the point of the Quaker ad was to offer a “free” jar for you to make said Overnight Oats in. However, I’m sure any bowl or kitchen container would work well. I just happened to use one of the Ball jars that I bought for the lettuce experiment. Just a tablespoon, although next time, I might try less. And a tablespoon of peanut butter. Crunchy, of course, or what’s the point? I just prefer crunchy, that’s all. Mexican vanilla, not the homemade stuff this time. OK, this was prior to the stir. At this point, it doesn’t move without help. The chia seeds also absorb a whole lot of the liquid, so it’s like you added powdered gelatin. If you want your oats a bit thinner, you could add a little more milk or water at this point. Because it really won’t move. I used that big silicone spoon-type spatula to get it all out of the Ball jar and into a bowl. Scraped every drop of it out. I’m not fishing it out with an iced tea spoon. I want some food! It was pretty good, and filling, too. If I were still working downtown, I’d take some of this with me to eat mid-morning. And where has this been all our lives? Hiding out in someone’s grandma’s idea factory, I guess. But now that it’s out on social media, the idea is available for all of us to enjoy, just like the great waffling ideas. See, we as Americans, or maybe some of us, have this thing where we want to make things better. Sometimes, it’s a blogger like me messing around with a new way to do something, or like Elena Amsterdam, making easy, tasty grain-free foods. Sometimes it’s a kid who looks to solve a problem and ends up inventing something new and highly useful. And sometimes it’s an engineer, project manager or IT person who just knows there’s a better way to do things and changes the direction of an entire company or industry. But we all think about it–there’s got to be a better way. As Americans, we look to do that. I know it’s not always Americans, though–our “better way” ideology has spread, thanks to things like social media, and now one good idea can be spread across the world to those in need of it. So, like slow cooking and waffling, Overnight Oatmeal is one more new trend to make life–and your breakfast–easy, and keep your kitchen from heating up in the long, hot summer. (Especially in Texas.) Do a search, or get on Pinterest and find something you like for breakfast tomorrow, so you can set it up this evening. With Pinterest recipes, you could literally eat a different variety of oatmeal every day and never have the same thing twice. Now, you see the pictures (or “pins”) that come up, but look above that. Just under where I typed in “overnight oatmeal,” you see all those little rectangles with different descriptions in them. “In A Jar,” “Healthy,” “Crockpot,” “Frozen Fruit”–all those are buttons that refine your search by those topics. (That’s a thing when you search for something on Pinterest–very useful.) Touch the arrow to the right, and you’ll see more refinements. Keep going until you hit the end, if there is one. Just takes a little getting used to, and you can find just about anything on Pinterest. Type in something else you’re interested in if you don’t believe me. And here’s something else to think about: if you make it while you’re either making dinner or doing the washing up, you’re done for the night. So–what will you try first?